Crumble beef into 2-quart microwavable casserole. Add onion. Cover loosely and microwave on High 5 to 6 minutes, stirring after 3 minutes, until beef is no longer pink; drain. Stir in ravioli. Cover tightly and microwave 5 to 7 minutes, stirring after 3 minutes, until hot. Sprinkle with cheese. Cover and let stand until cheese is melted. For variety, try pizza- or taco-seasoned cheese instead of the mozzarella. 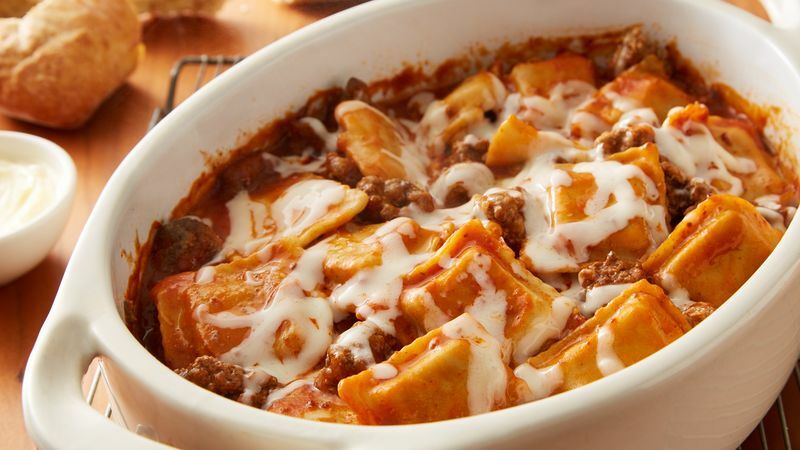 Or use cheese ravioli in place of beef for a vegetarian meal. Use this quick and easy ground beef cooking method when you want to save time and keep your skillet clean!